We’re delighted to announce that Chiltern Railways have announced us as one of their 2017 charities of the year. Each year, the train operator works with two different charities to raise funds and awareness. We were nominated by their employees as several of them have been affected by bowel cancer. Brake, the road safety charity, has also been chosen. 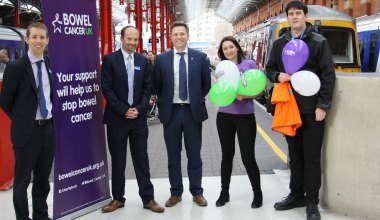 Luke Squires, Director of Fundraising, was thrilled to launch the partnership at Marylebone Station in London, says: “We are absolutely delighted to be chosen as one of Chiltern Railways charity partners for 2017.